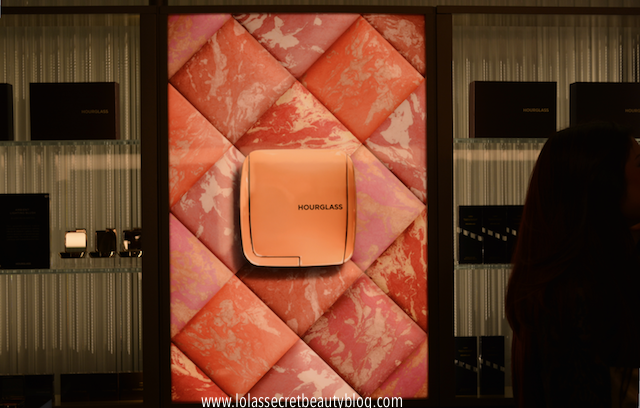 Few recent beauty events have made me happier than the big party on September 18 to celebrate the unveiling of the Hourglass Cosmetics Flagship Store at 1351 Abbot Kinney in Venice. This is the first brick and mortar store that founder and CEO Carisa Janes has opened, and this momentous event likewise marks the ten year anniversary of Hourglass. The store officially opens to the public today (Monday, September 22). The highly anticipated, by invitation, store unveiling was filled with many industry insiders including publicists, magazine editors, celebrity makeup artists, estheticians and beauty bloggers-- to name but a few of the attendees. I am thrilled and grateful to have witnessed this historic unveiling, and I thoroughly enjoyed this wonderful celebration. The architectural space is itself a significant accomplishment, and while a modern masterpiece it lacks the austerity of many contemporary interior spaces. Original brick walls and the discovery of wooden ceiling beams, hidden beneath years of Sheetrock, are ingeniously juxtaposed to undulating glass walls, and zig-zag sculptural lighting that echoes the shape of the gorgeous display unit beneath it. It is a beautiful architectural study fusing the old with the new in a stunning 1400 square foot retail space that has a wonderful loft upstairs with multiple stations for makeup application, makeup classes and other special events. The view as one walks through the front door. Every space the you encounter is so beautifully articulated. Despite the fact that the space was packed during the event-- it remained comfortable to navigate. The logically arranged display space makes it very easy to find precisely what you are looking for. Have you ever seen a more beautiful way to display makeup? The Ambient Lighting Bar is a Flagship exclusive that allows clients to customize their own palette of Ambient Lighting Powders. Can you imagine?! Such a brilliant idea to have your favorite shades of this groundbreaking finishing powder in a single palette! Gorgeous Calacatta Marble countertops and Onyx Quartz sides grace the sculptural structure upon which the Hourglass collection is elegantly displayed. The design is at once modern and timeless-- yet accessible in that it invites the clients to linger at each of the artfully composed Hourglass vignettes. Light illuminates and permeates the architectural and sculptural interior, and it serves to enhance the airy nature of the elegant minimalist space. Not a single detail was left to chance in the conception and execution of this masterfully conceived space, and one feels as though they have just stepped into a modern interior sculpture garden punctuated by Hourglass jewels throughout. I can hardly wait to go back and experience the space again. In my dream house remodel I would hire Standard, the Los Angeles architecture firm who created this space, to build me a modern masterpiece! Janes says that the store is, "designed to engage our clients and tell the brand story in a holistic way." 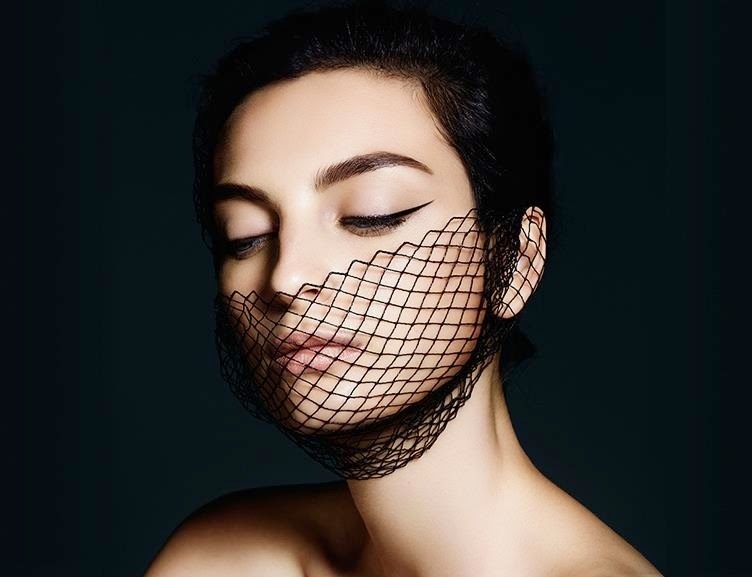 She further stated, "We are free to be creative and present something truly special, such as capsule collections and limited edition products." Bird's-eye view of the first floor as seen from above. The mirrors alone are masterpieces in craftsmanship! The second level loft is the home of makeup classes and private services. The Makeup Artists working their magic on the many Hourglass devotees. A stunning ethereal wall composed of glass rods magically captures the light in the interior space, and the curvilinear shape arcs across the front window. Mary is the beauty on the right. DJ Rashida played amazing music all night long! The event was very crowded, therefore I wasn't able to take unobstructed pictures of the interior space. I am arranging to go back and photograph the space in order to show you clear views of this architectural masterpiece. It was, however, my intent to share this amazing evening in enough detail that you feel present! Coming Soon: A Limited Edition Ambient Lighting Blush Palette for the holidays featuring 3 shades: Luminous Flush, Mood Exposure, and an exclusive new shade, Incandescent Electra. Hourglass is also launching their very first skincare product, and it is an otherworldly serum that I had the pleasure of trying at the event. Equilibrium Biomimetic Skin Active Serum is a nighttime anti-aging treatment serum that specifically targets cellular regeneration. It employs cutting edge technology that was described to me as one that utilizes a "micronized oil-in-water emulsion" that intuitively works with the needs of the skin and that triggers epidermal renewal. Hourglass posits that, "it relies on a bio-identical Phosphatidylglycerol, the youth lipid that occurs in high concentrations in amniotic fluid, which is found to normalize skin growth and reduce the signs of aging." It is a anti-aging powerhouse that is sure to become the serum. I will say that it left the backs of my hands so soft and supple that I can hardly wait to try it on my face. It has been in the making for the last two years, and the beautiful condition of Carisa's skin is the only selling point that I need! Equilibrium is among the store's exclusive items. ...and what a lovely gift, indeed! If you live in the Los Angeles area it is very worth your while to visit the gorgeous Hourglass Boutique. Oh God, I am SO SO jealous I don't even know what to say now!!! An Hourglass store??? That's like a dream come true! Would so love to customized my own Ambient Lighting Palette, and I hope they'll eventually make it happen for the blushes as well! lol that's exactly what i was thinking! maybe they can go two step further and let us combine lighting and blush into one palette! p.s. i'm jealous too! that serum sounds very interesting! That would be an AMAZING combination, and I wouldn't be at all surprised if it eventually became available. My bet is that the LE blush palette will be so wildly popular-- just as The Ambient Lighting Palette has been that they may choose to make it permanent and customizable! FINGERS CROSSED!!!!!! The serum is at the top of my list of things that I must try!!!!! It was a really special event, and I am so grateful to have been invited! 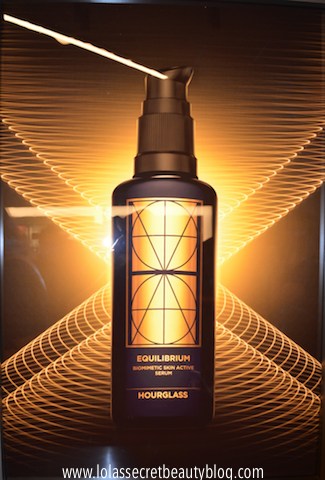 The Equilibrium Serum is an exclusive to the Hourglass Abbot Kinney Boutique. I don't yet know if it will be available on the Hourglass website. There will be certain products, like the serum, that will remain boutique exclusives.